At the start of the 19th century the Grand Surrey Canal succeeded in linking Camberwell and Peckham to the Thames, but the last boats operated in 1970 and the cut was sequentially filled in. Various sections have since become housing, parkland, industrial estates and linear walks, and remain surprisingly traceable. I'm going to attempt to walk the entire canal, as close as I can, over the next two days. Perversely today's account starts in the middle and heads for the Thames, simply so that the entire canal walk reads sequentially once I've finished. I'm kicking off at Ilderton Road, a balls-throw from Millwall's football ground, as becomes entirely obvious if you head this way on a Saturday afternoon. Half a century ago the canal and towpath passed under Canterbury Bridge, but in the 1980s the cut to the east was filled in to create a half-mile thoroughfare called Surrey Canal Road. It's yet another example of infrastructure named after the thing it destroyed. 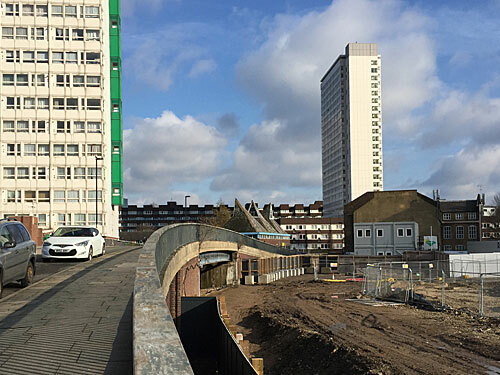 The road proved invaluable as a connection because it passed under no fewer than four railway viaducts, the first of which carries the line from South Bermondsey station. Someone round here has a grudge against gentrification and a spraycan of white paint, as long angry messages across each of the railway bridges attest. The immediate investment opportunity was supposed to be called New Bermondsey, and would have swept away all the surrounding warehouses and football stadia in favour of a massive mixed-use redevelopment. It's been stalled for years, as has the Overground station which was supposed to be built above Surrey Canal Road, because funds have never quite been willing. You'd never guess today, but the road junction immediately alongside the third railway bridge used to be a canal junction. The Croydon Canal joined the Grand Surrey Canal here, piggybacking the latter to the Thames, but by 1837 had entirely closed save a short inlet here where Mercury Way now stands. For a firmer clue to past usage, look out for the rusty mooring bollard which survives on the opposite side of the brick arch. Surrey Canal Road halts at the railway bridge supporting the South Eastern mainline, but the canal used to continue through a gap now stopped up by locked gates. Beyond were timber sheds, rope works, a galvanisers and a box factory, plus the Neptune Tar and Chemical Works (whose residential redevelopers are proposing to retain only the first word from its former name). 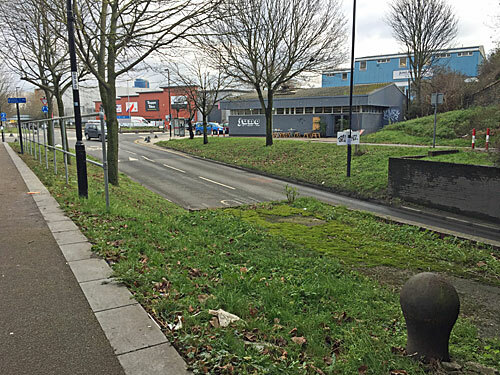 Current businesses shoehorned down the former canal are more likely to be warehouses, linked by a private access road following the former towpath. Blackhorse Bridge, on Evelyn Street, is a proper reminder of the canal's former presence. It humps slightly for no visibly-necessary reason, retains spiked parapets on either side and features a decapitated lampstand at each end of the span. I wasn't the only one stopping to admire the peeling craftsmanship. But peer over the edge to where the Grand Surrey Canal once bent sharp left and no trace of the past remains. 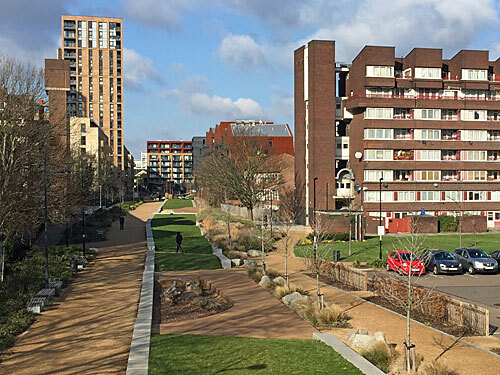 Its wharves, gantries and engineering works were originally swept away by the Victoria Wharf Trading Estate, which has itself just been levelled to create space for a major residential development called The Timberyard. 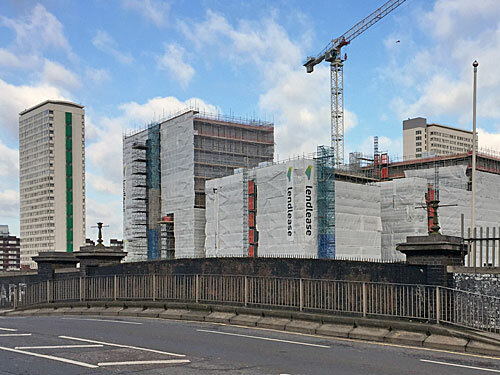 The site is flat as a pancake at present, bar one First Phase enclave, but future phases will raise 1132 generic flats across the site. These are depicted on illustrations around the perimeter, in which the artist has gone to enormous efforts to show the entire development populated by under-35s. A nice touch is that a linear park will be created following the line of the canal, but the water feature which defines it will be a weedy, narrow, shallow trench, no doubt beautifully lit but historically bereft. 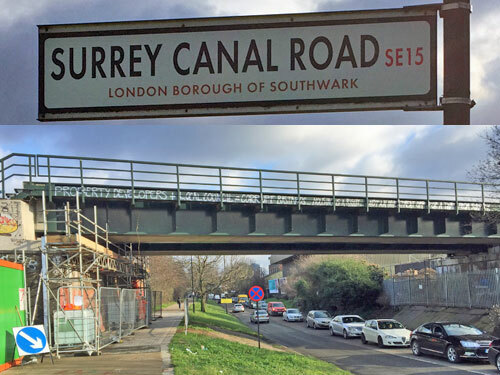 It should however reconnect under Oxestalls Road, whose low swoop (in the early 1960s) was the last bridge to be built across the Grand Surrey Canal. Surrey Canal Linear Park is new, by which I mean less than three years old - a long strip of recreational space following the alignment of the old canal. It starts amid the Pepys council estate, in the shadow of the Eddystone Tower, and heads north into the much more recent Marine Wharf development. One side of the park is meant to echo the canal, a straight path edged by raised flagstones, into which a poem by Lemn Sissay has been carved. He's very much the go-to inner-urban poet for this kind of thing, and his words meander intriguingly and meaningfully along the bank. Various recreational amenities have been scattered along the remainder of the park, including sandpits, flowerbeds and sheep-shaped benches. It's very nicely done, but it's hard to avoid the fact that all the nicer bits are up the private end. Along this stretch it's like walking through a brick canyon where no curved surfaces are permitted, lined by pristine topiary and watched over by contractually-empty golden balconies. This is where the incomers live, catered for by a cafe with an outdoor olive grove, a handy delicatessen and a barbershop that specialises in manscaping. Greenland Dock is the oldest on the peninsula, used for processing whales and timber in the early 18th century. When the Grand Surrey Canal was first built it was a lot smaller, so the canal skirted its flank and continued north to the Thames as a single channel. Within a few years the Surrey Commercial Docks grew along its path, becoming a maze of interlinked basins spread across former marshland and a mainstay of London's maritime economy. Barges reached the river via Russia Dock and Stave Dock, since filled in as recreational spaces, and all trace of the earliest waterway rapidly disappeared. 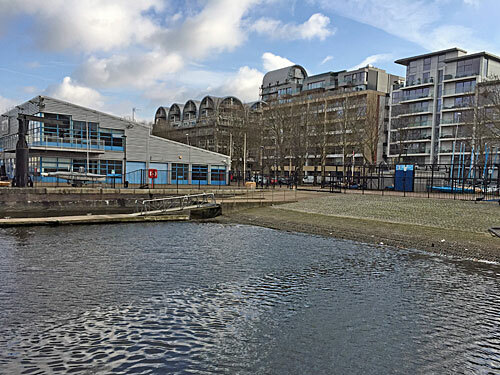 But you can still see the point where the 20th century canal entered the extended Greenland Dock, because that's now the slipway alongside the Surrey Docks Fitness and Water Sports Centre. That's where I'll end my walk, except to jump across the peninsula to the point where it originally entered the Thames. The Surrey Docks complex emptied via Surrey Basin through Surrey Lock, where the chunky red swingbridge that used to carry the riverside road remains. Today it's watched over by a ranch-style Greene King pub, a few old capstans and the southern Rotherhithe Tunnel ventilation shaft. I think the original canal met the river fractionally further east, amid 1990s residential fortifications, although it was never here long enough to make a permanent mark. I did get a pleasing waterfront sunset out of my visit, though, a world away from Camberwell and Peckham.